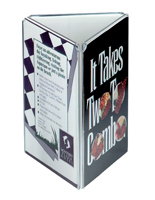 This table tent is six-sided allowing users to display several signs in one fixture. 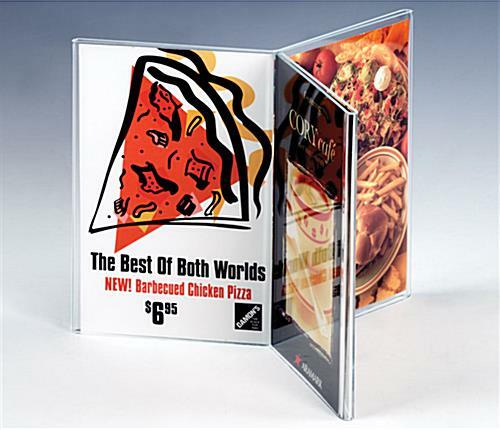 Restaurants and bars typically use this acrylic sign holder to promote new menu items or drink specials. 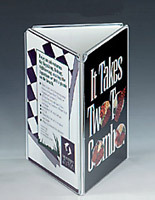 Each table tent, also known as a tabletop advertising frame, holds six 4" x 6" graphics. This multi-panel design is perfect for bars and taverns with relatively small tables and counters. Use this table tent to highlight an appetizer or dessert menu for patrons to look at throughout the course of their dining experience. The open-top design enables users to change out graphics in a matter of seconds. Each table tent that features a "Y" shape design offers a clear view of the signage from every seat. This acrylic counter sign is an effective means of promoting products or services within any retail store, restaurant or other public area. 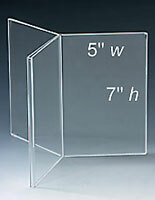 This table tent, acrylic sign frame, is like getting six holders for the price of one. 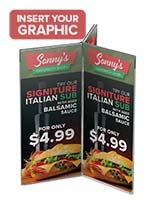 Shoppers typically purchase this menu display in large quantities to have extras on-hand, and to take advantage of the lower pricing. 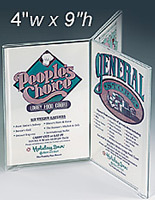 This table tent, such as a menu display, can also be used to hold family photos. 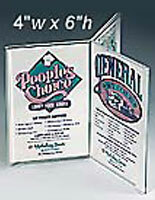 The 4" x 6" size is a common size among retail photo printing stores. This table tent keeps pictures and signage protected from airborne contaminants as well as fingerprints. 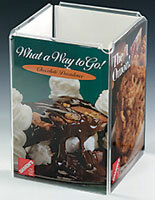 This multi-sided sign frame qualifies for same day shipping when ordered before 3PM EST weekdays. Buy this table tent now! I ordered this product and it came quicker than I assumed it would come. The product is excellent! It sounds like you were completely satisfied with all aspects of your recent experience, Rachhpal. We are glad to hear it! This is a great product. I love that is shows 6 different advertisements. I do wish that it was top loading so that the papers don't slip out from the bottom when the tabletent is picked up. I do use this in all of our dining halls due to the maximum advertisements allowed. Please keep products like this on your shelves. Thanks! As title and quick responses. We are using the spindles to advertise the programs and services in our Learning Center. 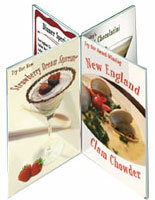 They are both sturdy and flexible, while being easy to insert pictures and marketing materials.